PopcornBiz Takes a Maid of Honor to "Bridesmaids"
We Take a Maid of Honor to "Bridesmaids"
We’re not smart enough to know why exactly Hollywood has such a tough time producing female-driven comedies that don’t center on a woman’s biological imperative to wed and breed. 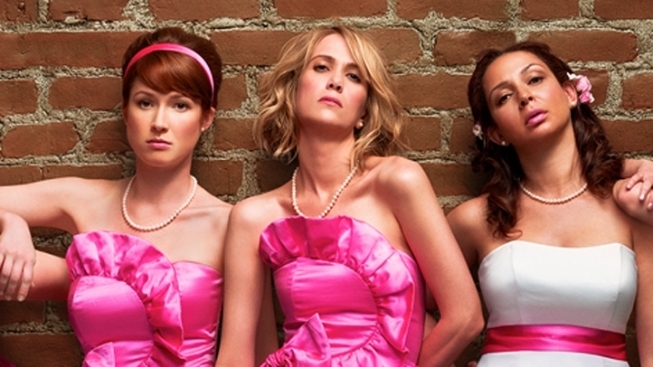 We just know that “Bridesmaids” is irrefutable proof that such a film can be hilarious. “Bridesmaids” stars Kristen Wiig as Annie, a single woman with a failed business, a mercilessly degrading “f***buddy,” a pair of sibling roommates, a mother who attends AA meetings despite having never had a drink…she is, in the parlance of the time, a loser. And when Annie learns that her best friend, Lillian (welcome back, Maya Rudolph! ), is getting married, it only brings into focus just how bleak things are. At first blush it would be easy (read: lazy) to mistake the set up of “Bridesmaids” as pointing toward yet just another romcom, but structurally the film actually resembles “Superbad”: two best friends since childhood about to be separated by the tides of life, leaving one of them feeling jealous and abandoned. Annie is the perfect role for Wiig--and it should be seeing as she co-wrote the film with longtime writing partner Annie Mumolo. Wiig seamlessly switches gears across the comic spectrum, contorting her rubber face to full effect. But she’s also great in the film's more serious moments, as Annie confronts the mess she’s made of her life, without it feeling maudlin or melodramatic. Rose Byrne once again confirms her comedic chops, as Helen. She's the perfect foil for Annie: rich, beautiful, cultured, thin, stylish…everything Annie wants to be. But Helen’s also a vain, petty, backstabbing monster. Byrne’s work here isn’t as showy as her turn in “Get Him to the Greek,” yet it’s still great fun to watch, and brings out the best in Wiig. But it’s Melissa McCarthy (currently starring on “Mike & Molly,” though probably best known as Sookie on “Gilmore Girls”) that is “Bridesmaids” secret weapon, positively crushing every line, gag, moment and look throughout. Wiig is definitely the star, but it’s McCarthy who will have you cringing through gales of laughter. Really, the whole cast is loaded, with the likes of Jill Clayburgh, Terry Crewes, Wendi McLendon-Covey, Elli Kemper and Jon Hamm all bringing the funny, in even the most minor of roles. Director Paul Feig does a great job of spreading the jokes around without letting the film ever lose its focus, keeping the tempo brisk enough that you don’t even notice that it’s a (normally ungodly) 124 minutes long. "Bridesmaids" is as funny, crass, gross, thoughtful, sweet (in its way) and every bit as good as you'd expect from the talent involved.